Forget fusion, say “toodle-oo” to tapas and wave “buh-bye” to ultra lounges. This year, the clear trends in dining are all about healthy, organic, natural, house-made and unique. Thanks to the surge in family-run gourmet food trucks, healthy fast food joints and in-house herb gardens for specialty cocktails, diners no longer need to reserve a table at a specialty restaurant to experience the best in quality ingredients. While the truth in dining is that if it’s done right it will stand the test of time, we take a look at some relatively new establishments that already are local trendsetters. Sustainably grown, locally sourced ingredients and all-around sensitivity to synthetics and pesticide use is a very welcome trend. While it is difficult for restaurants to offer 50-page menus and any ingredient any time of year while following this premise, the truth is most patrons prefer the freshest, most high-quality ingredients, even if that means a limited or changing menu. Positioned as a true farm-to-table restaurant, this charming spot does this trend justice. Focused on sourcing organic foods and keeping in close contact with local farms and markets, the restaurant also sets itself apart from the rest with its emphasis on locally sourced seafood. The line-caught, day-boat swordfish receives rave reviews and its snapper comes from the Keys. All beef is from cattle raised and processed in Florida – Max’s Harvest serves Seminole Pride’s Black Angus beef while the brisket, chuck and dry-aged sirloin are from Larry Kline Meats. The restaurant also composts its scrap produce and donates it to Farmer Jay of Farmer Jay’s Organics. New to the menu are the pan-seared diver scallops and a delicious version of the banana cream pie – banana custard layered with bananas Foster, molasses cookie crumble and a brûléed vanilla custard and locally grown Nam Wah bananas. Another of Burt Rapoport’s creations, this latest concept also showcases a menu that features a number of items sourced from sustainable farms. Creekstone Farms provides the beef for the grilled skirt steak and the Prime Dry Aged NY Strip. Murray’s Free Range Chickens provides the Free Range Roasted Half Chicken and Southern Fried Chicken (served in the Southern Fried Chicken and Waffles dish); and the branzino for the Mediterranean Branzino “a la Plancha” is farm raised. No longer do the terms healthy eating, organic, locally sourced ingredients or farm-to-table mean a restaurant is more apt to be small, mom-and-pop or rustic. Grille 401 is a perfect example of the importance of farm-to-table and how it easily can be integrated into any fine-dining establishment. A proud supporter of local farmers, Grille 401 features a seasonal menu that regularly takes advantage of readily available local ingredients. Comprised of a local favorite, the signature chilled kale salad is a very popular menu item, while other local ingredients include the tomatoes in the tomato stack and the delicious corn relish that accompanies the crispy crab fritters. When you’re out and in the mood for a refreshing cocktail, forego the standard martini, gin and tonic or cosmopolitan (did 1990 call and ask for its drink back?). Instead, give the bartender your flavor preference and sit back while he works his magic. Nearly every new restaurant is offering something in the way of specialty cocktails – even non-alcoholic beverages are becoming a trend of their own, from fresh-squeezed lemonade to coconut water, ginger beer and specialty iced teas. In short, you have no excuse to feel parched. Along with a revamped menu from Chef Mark Militello comes a specialty cocktail offering that is exemplary of this new trend: tried and true with a twist. If you’re a margarita lover, why not go a little crazy with the Esta Loca Margarita, comprised of Patron silver, pomegranate juice and fresh lime and orange sweetened with agave nectar. Or take advantage of the myriad flavored liquors with the Van Gogh açai blueberry vodka with muddled mint, lime and fresh blueberries with a splash of soda water. Still can’t shake your love of the cosmo but don’t want the weird look when you order? Try the Some Like it Hot Cosmo with Fireball Whiskey and cherry vodka, shaken with muddled maraschino cherry. Or, for a fun after-dinner drink, how about Bailey’s and Amaretto with a hint of banana liquor and topped with fresh nutmeg? From its bar-top herb garden to its entertaining liquid nitrogen frozen concoctions courtesy of mixologist and master sommelier Adam Seger, Tanzy goes the extra mile when crafting a specialty cocktail offering. Delighting the patrons of its main restaurant and iPic theater movie-goers alike, Tanzy not only offers plenty of signature cocktails, but also several fabulous spirit-free cocktails. Called “Nojitos,” these drinks include Tanline, Illegalito, Floridian or Mojitonico for all of the taste without the alcohol. Want a great summertime refresher? Order a pitcher of the housemade Passion-Ginger Ale. With locations in Palm Beach Gardens and Pembroke Pines, RA Sushi Bar and Restaurant specializes in cool beverages sans alcohol. Specialty iced teas are a terrific complement to sushi dishes, with unique flavors such as Ginger Beach Decaf, Passion Fruit Green Tea, regular Green Tea and Pomegranate. House-made strawberry purée mixes with lemonade for one of our favorites: the simple strawberry lemonade. Palm Beach’s latest hot spot now kicks it up a notch on Saturday evenings with an enhanced cocktail list and live musical entertainment. Designed by mixologist Nick Scalisi, the unique specialty cocktails on offer include the PB Spice, a mix of spicy vodka, pineapple jalapeño with a sage infusion; and the Watermelon SOB, tequila, watermelon and a cilantro infusion. Couple these drinks with a sophisticated bar menu and “sea-cuterie” offerings (to mimic the housemade charcuterie trend) with options like salmon pastrami, smoked trout, octopus terrine and marinated anchovies and some fascinating live musical entertainment and, well, the weekends just got a little bit more fun in Palm Beach. Our favorite dynamic duo created by Chef Clay Conley offers its own array of funky cocktails. In time for summer, Imoto offers Cataloupe – muddled cantaloupe with the Japanese liquor shochu. A martini at Imoto this summer will be offered as blueberry, ginger lemongrass or coconut – all mixed with an icy sorbet. buccan offers its house specialty, the buccan T, which is vodka with basil, unsweetened iced tea, cranberry, citrus and agave nectar. Or, try the Rosemary’s Baby, cachaça, lime, rosemary-infused triple sec and ginger beer; or the Frida Kahlo, which is blanco tequila, fresh blackberries and ginger ale. Yup, even when it comes to drinks Chef Conley and his team create jaw-dropping flavor combinations. We couldn’t resist mentioning two yummy cocktails on offer at Grille 401 in Fort Lauderdale, whose names would easily be mistaken for dessert offerings. The Chocolate Cake Martini is Van Gogh vanilla-flavored vodka mixed with Frangelico, white crème de cocoa and cream. This is like an adult milk shake. Those on a restricted diet will no longer be left in the cold with the Gluten-Free Greyhound, locally grown, fresh squeezed ruby red grapefruit juice; and Tito’s Handmade (gluten-free) vodka, served tall. We couldn’t pass up the opportunity to applaud the rising trend in fast-food restaurants with a sustainable or healthy focus. Hooray! In a hurry? Stop by one of these great places for a fun, fast meal that won’t make you feel as if you’ve sold your soul. This place has gone to the end of the spectrum in providing quick meals for the calorie-conscious. Everything on the menu is grilled, baked or steamed and less than 500 calories. Our only suggestion: skip the sugar-free soda offerings and stick to water. Gourmet burritos and tacos. No more, no less. This is “food with integrity,” every ingredient is sustainably sourced, without synthetic hormones or additives, and raised “with respect to the environment, the animals and the farmers.” The best part? It. Tastes. Awesome. Made-to-order gourmet salads, whole-wheat crepe wraps, and paninis and sandwiches on artisan bread. Gluten-free menu available. This all-natural burger franchise is yummy yummy yummy. 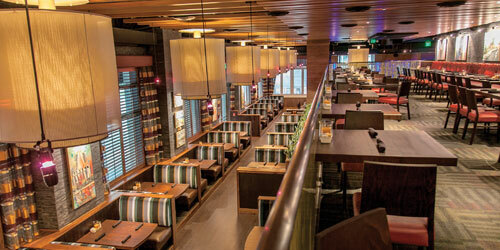 Each burger is made to order featuring farm-raised beef and served in a sustainably conscious setting. Talk about chasing down a good meal. The food truck craze has swept the nation, and South Florida has not been left unaffected. They gather in circles at events, rally in local abandoned parking lots or simply show up on a quiet side street and wait…until discovered by throngs of followers. Not only do owners enjoy the break from the overhead of brick and mortar establishments, they are able to narrow their focus to whatever cuisine they do best and enjoy a diverse following by being able to seek out their customers as much as customers seek them out. You can find these trucks anywhere from Delray to Hollywood. Check out their websites or call for exact location. It’s hard to miss a giant stove on fire rolling down the street. But when you do come across The Rolling Stove food truck, it’s worth a visit. For there are burgers and then there are Rolling Stove burgers…and sandwiches…and hand-cut fries…and pulled pork…and jerk chicken empanadas…or how about the Dr. Pepper jerk brisket? … Top it off with a fresh-made beignets and your quest for comfort food is complete. Chef/Owners Oren Bass and Zachary Schwartz have embraced the Slow Food movement quite literally. From their two food trucks – Slow Food Truck and SFT Bistro – they serve slow-cooked dishes comprised of seasonal, local ingredients sourced direct from the farm. Everything is prepared on site, including the 8-hour roasted pulled pork. From the burgers (try the blue cheese-stuffed dream that is “The Stank”), sliders and sandwiches to the butter-poached Florida lobster roll or chili cheese dog “served Jersey style,” everything at the Slow Food Truck is made with the delicate attention to detail that only two culinary school graduates and gourmet restaurant chefs can do.